For the past 5 years, in a secretive laboratory, car manufacturer Peugeot has been developing its next line of cars - well more like its new main line of engines. 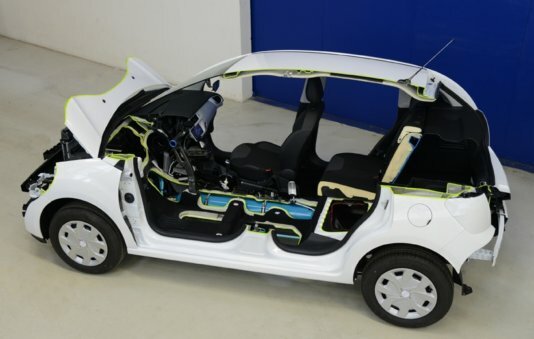 Finally, last month the French manufacturer unveiled its secrets to the world – the first ever hybrid gasoline/compressed-air vehicle. The new engine is a combined, dual system. It's normal gasoline engine works like any other in the market that runs on petrol, but is much more economic and efficient. However, the innovative second fuel system converts kinetic energy into compressed air. Peugeot has called its new system the HybridAir. This hybrid system uses a 1.2-liter three-cylinder gasoline engine, and a hydraulic motor to drive the front wheels. Similar to gasoline-electric hybrids, braking energy is captured and, in this case, stored as compressed air in a tank. The HybridAir can be driven solely on compressed air power, gasoline, or both. When the system has enough compressed air stored in its tank, it will automatically use it for acceleration or to drive the car, shutting down the gasoline engine in the latter case. The system uses the energy from the compressed air to power a hydraulic motor in the engine compartment. A transmission, similar to that found in many gasoline-electric hybrids, combines the power of the hydraulic motor and the gasoline engine to drive the front wheels. The company states that trials have demonstrated the ability of the new engine to consume less fuel. While driving in the city, a mode of travel that requires a lot of breaking, the compressed air engine supplies up to 80% of the power needed and produces almost zero emissions. In a combined mode the emissions are 69g/km, as compared to 88g/km of CO2 in a conventional engine. The fuel consumption puts the car in the range of a staggering 2.9l/100km. While still using fuel as the main power supply, the important thing is the possibility of reducing emissions drastically by fuel economy. The company states that this engine will be in production by 2016, and will be cheap to manufacture. Estimates put a starting price of 19,000 euro on the new car. That’s almost 6000€ less than the Toyota Prius, and comes without the Prius' lithium-ion battery and its associated negative impact on the environment. HybridAir seems like the new best option for a real affordable change.